It's funny how velvet has been making such a big comeback this season, and while I might not jump head first into the revived trend with a body-con or fit and flare dress, I will happily pull out my blazers. Velvet pants have crossed my mind, something structured of course. Though I might not refuse a pair of leggings, especially to have as loungewear. Are you on board with the velvet trend? I'm ok with very limited velvet pieces! I also have a blazer that I would wear but not ready to wear a dress or skirt. 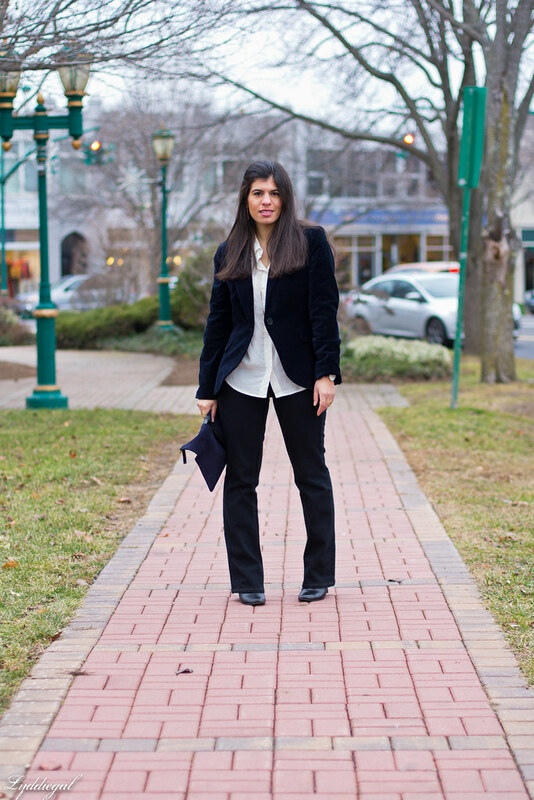 Love this navy blazer and it doesn't look like it's velvet. I do love my velvet! I kind of miss all the long sleeve velvet shirts I used to have as a youngin'! I am in love with this blazer! I think I definitely need a velvet one now too. 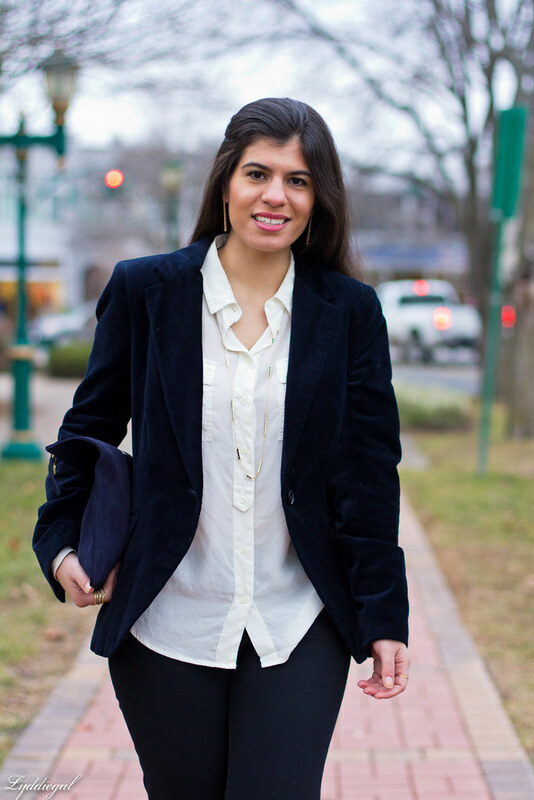 I love velvet and would love to have this blazer.It fits you to a tee and you wear it well. Happy Holidays! Such a great blazer! I just invested in not one but two pairs of velvet leggings and I've been loving them. So comfy. I have always loved velvet.. little did I know it was off trend and now its back. Its good to know, I have a velvet dress I should pull out of the closet and wear.. if it fits. I love velvet and am glad to see it back for the holidays! BTW, I love your outfit! This look is perfection...so classic and elegant! I don't have a lot of velvet, but I do like it. I think it's one of those things I don't wear often enough to buy much of. I love velvet blazers. They just look so luxurious. 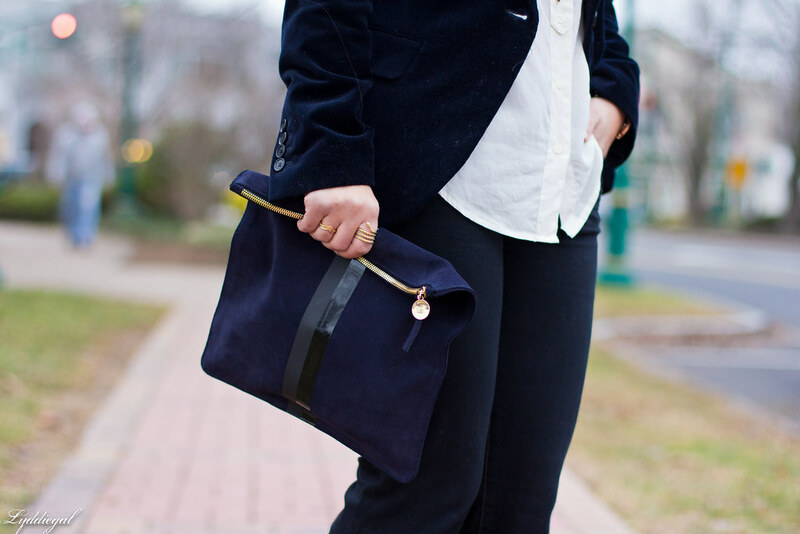 I love a velvet blazer and your clutch is so pretty! It's true, velvet has made a huge comeback the past couple of seasons. I still have a vintage velvet blazer that I bring out a couple times a year. Love your blazer and outfit. Merry Christmas! Your blazer looks so lux! It's making me regret giving mine away some time ago. So adorable! Love the velvet blazer. Looks great with that blouse! Such a cute blazer! I like velvet with some pieces like a blazer or pants. I'm not sure if I go for a velvet dress though either. It seems like that would be too much for me. I'll be honest - I've already done velvet twice in my life (once not very long ago at all) and I'm not sure I'm ready to get back on the bandwagon again, since the trend seem to last less long every time. With that said, though, I love the richness of the fabric and blue velvet is my absolute favourite. (I had my heart set on a blue velvet blazer from J Crew in 2007, I'm still heart broken that I didn't get it.) So naturally, I'm a big fan of this look. And I'm also pro velour leggings for lounging at home - I used to have a pair and I wore them to death, quite literally. Merry (almost) Christmas! I have a burgundy velvet jacket that I typically only wear this time of the year. Though, i haven't warn it yet. I tend not to buy too much in velvet because it's limited in time of year that it feels right wearing. I love this rich blue blazer on you. 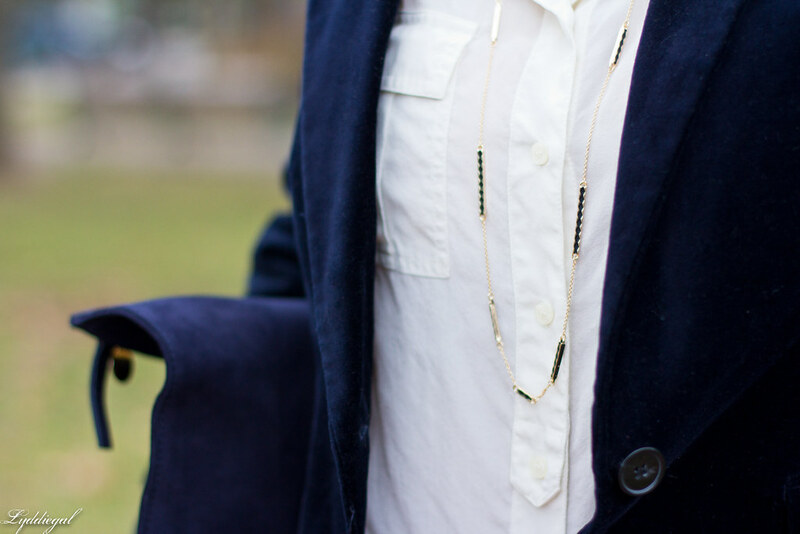 Gorgeous blazer and clutch! I adore them both! Merry Christmas! 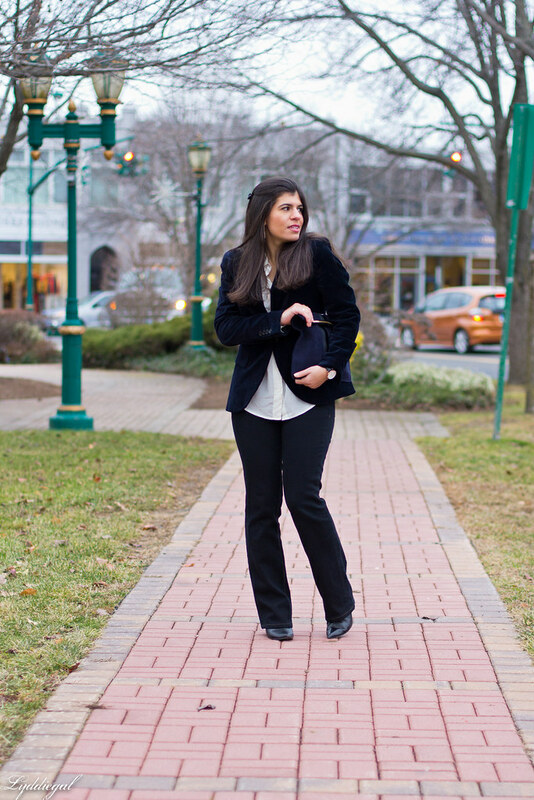 I'm loving your blazer and bag! They are classic, but statement pieces too! 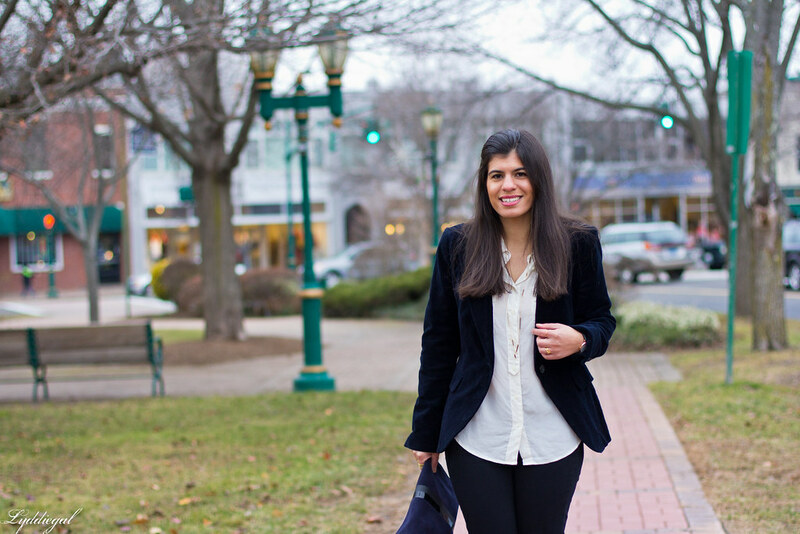 velvet is so luxe and i love the look of it with this blazer! I love this outfit! Your clutch is so cute! That blazer is perfect!!! great outfit!!! I love velvet! I have a couple of blazers and ordered some jeans this year. Very tailored. Great look so chic, lovely. I have a velvet blazer too that I thrifted and I have been stoked to wear it more now that it is actually cold here! I would totally sport velvet leggings. Sounds comfy! This is a GREAT structured look! I hope you had a very Merry Christmas! I totally love the velvet blazer! I've been looking for one for forever. I might have to try out the J.Crew version! Its the perfect time to wear velvet, thanks for the reminder! Love your clutch! Clare Vivier makes the best bags!